This brief, modular introduction to social psychology offers streamlined focus on issues such as belief and illusion, prejudice and diversity, and love and hate. The brevity of each of the book's 31 stand-alone modules makes this the perfect text for covering the core concepts in the field. 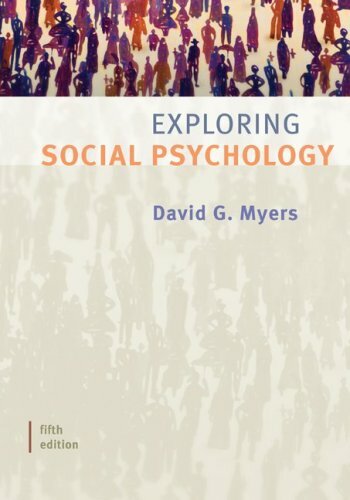 By introducing social psychology in an essay format and by writing in a voice that is both solidly scientific and warmly human, Exploring Social Psychology is able to reveal social psychology as an investigative reporter might, by providing a current summary of important social phenomena, by showing how social psychologists uncover and explain such phenomena, and by reflecting on their human significance. The new edition includes discussion of the Hurricane Katrina aftermath as an illustration of hindsight bias and availability heuristic, the Iraq War and belief perseverance, and terrorism and group polarization. David G. Myers is the John Dirk Werkman Professor of Psychology at Michigan's Hope College, where students have voted him "Outstanding Professor." Myers' love of teaching psychology is manifest in his writings for the lay public. His articles have appeared in two-dozen magazines and he has authored or co-authored ten books, including The Pursuit of Happiness (Avon, 1993) and The American Paradox (Yale University Press, 2000). Also an award-winning researcher, Myers received the Gordon Allport Prize from Division 9 of the American Psychological Association for his work on group polarization. His scientific articles have appeared in more than two-dozen journals, including Science, American Scientist, Psychological Science, and the American Psychologist. He has served his discipline as consulting editor to the Journal of Experimental Social Psychology and the Journal of Personality and Social Psychology. In his spare time he has chaired his city's Human Relations Commission, helped found a community action agency which assists impoverished families, and spoken to dozens of collegiate and religious groups. David and Carol Myers are parents of two sons and a daughter.